The Westminster Kennel Club Dog Show is on the bucket list of countless thousands. The second oldest continuous sporting event In the United States, it is held each February in one of the holy grails of sports, Madison Square Garden, attracts the crème de la crème of entries worldwide. Photo credit: Russell Bianca / American Kennel Club. Dogs are welcome at The Barkfest at Bonhams charity brunch in New York City on Westminster weekend. 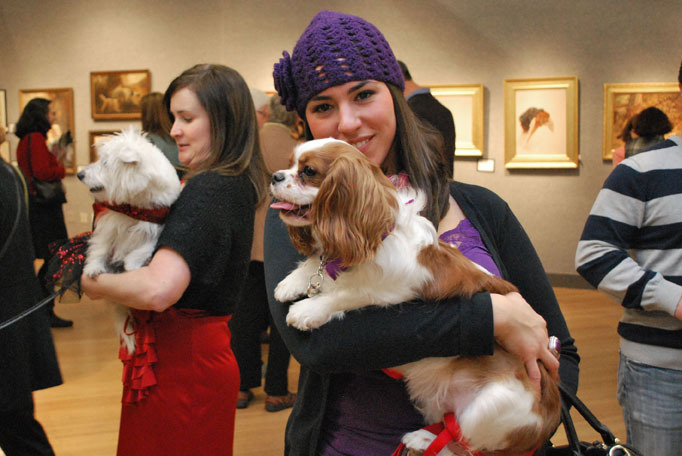 The celebration of canine art is scheduled from 10 a.m.-noon Sunday, Feb. 13 at Bonhams, New York, 580 Madison Ave. Proceeds benefit the American Kennel Club Humane Fund. Parties, parties and more parties are wrapped around Westminster weekend for the inside crowd. But what are you, Mr. and Mrs. Dog Owner USA, going to do in New York City for the lead-in to the show? Broadway shows, a Knicks or Rangers game or simply sightseeing are always an option. But if you’re in town for Westminster, a dog-oriented stop or two would likely be high or your list. William Secord Art Gallery: The only gallery of its kind in North America will celebrate its 20th anniversary and sale of 19th-century paintings with “Canine Masters,” a selection of some of the premier masters of Victorian canine portraiture. The exhibition and sale will include more than 25 works from artists such as George Earl, Maud Earl, John Emms, Florence Jay, Sir Edwin Landseer, Edmund Osthaus, Phillip Stretton and Arthur Wardle. Some of the breeds represented in their works are the bulldog, clumber spaniel, Dandie Dinmont terrier, English setter, Jack Russell terrier, Pekingese, pointer, poodle and wire fox terrier. In addition to the gallery exhibition, a selection of dog paintings will also be offered at the Westminster show Feb. 14-15. Gallery exhibition hours are 2-6 p.m. Saturday, Feb. 12; followed by 10 a.m.-6 p.m. Sunday, Feb. 13 through Tuesday, Feb. 15. Information: William Secord Gallery, 52 East 76th St., New York, NY, 10021; 212-249-0075; www.dogpainting.com. The Barkfest at Bonhams: The American Kennel Club Humane Fund benefit is scheduled from 10 a.m.-noon, Sunday, Feb. 13, at Bonhams New York. Entitled “A Celebration of the Dog in Art,” the annual charity brunch will feature a variety of works from some of the world’s premier dog artists. The AKC Humane Fund, a 501 (c) (3) charity, supports responsible dog ownership education and makes grants to breed rescue organizations and women’s shelters that accept pets. 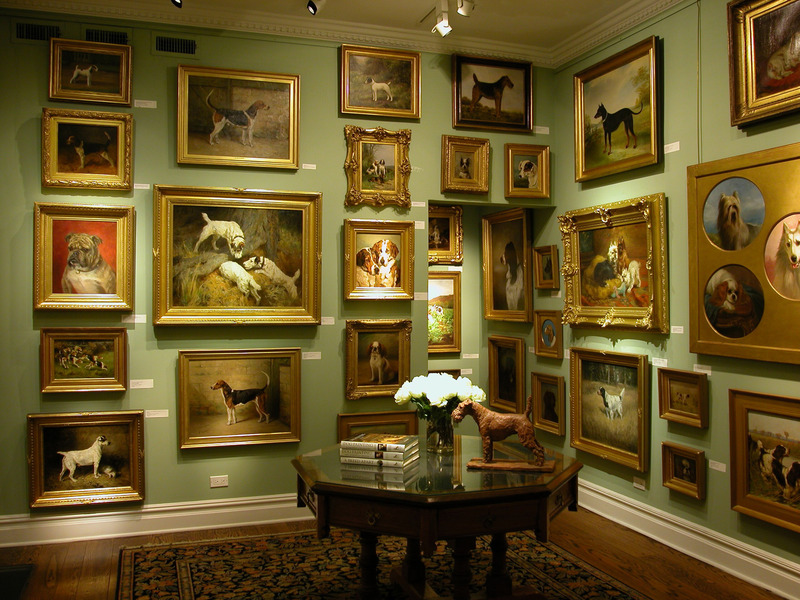 The William Secord Gallery, which features a wide array of historic dog art, is a must stop for many Westminster Kennel Club Dog Show visitors in New York each year. A "Canine Masters" exhibit begins Saturday, Feb. 12. Information: Admission is $50 donation to the fund (with reservations) or $60 at the door. Bonhams New York, 580 Madison Ave., New York, NY. 10022. Reservations: 212-696-8225. Therapy Dog Celebration at Tribute WTC Visitor Center: Following the attacks on the World Trade Center, therapy dogs played key roles in the recovery process. They were present at the family assistance centers established by the city, and others at the recovery site provided therapeutic assistance for the workers. On Sunday, Feb. 13 from 2 to 4 p.m. the Tribute WTC Visitor Center will welcome the public to a free, family friendly program. Rachel McPherson, founder of the Good Dog Foundation and her 14-year-old therapy dog who walked with her providing support to families and survivors, will appear. A second therapy dog and its handler will demonstrate how these canines offer comfort to those in need. Meeting the dogs and talking to their owners will allow the audience a special opportunity to open a dialogue about events surrounding Sept. 11, 2001. Information: Tribute WTC Visitor Center, 120 Liberty St., New York, NY, 10006. Visitor services phones: 866-737-1184 and 212-393-9160, Ext. 138. Hours: 10 a.m.-6 p.m. Monday; noon-6 p.m. Tuesday; 10 a.m.-6 p.m. Wednesday-Saturday; noon-5 p.m. Sunday. The Antiques Garage Flea Market: I was tipped off years ago about this weekend treasure-hunting destination in the Chelsea district. Consequently, it’s become a regular stop on my annual Westminster trip. Sometimes one comes up empty; sometimes you find a real gem. Many vendors will negotiate and are extremely passionate about their wares, which include eclectic antiques, decorative arts, paintings, prints, jewelry, rugs, furniture, old magazines and old pictures and used clothes from the ‘40s, ‘50s and ‘60s. Occasionally, you’ll find a booth or two with dog collectibles, from books to bronze bookends and from vintage art to collector cards. Some vendors aren’t there every weekend, so consider your treasure hunt a crapshoot in that respect. One of my best finds was a vintage bronze German shepherd statue. Equaling that was meeting a Pennsylvania dog-book dealer Leonard Brook, who frequents East Coast dog and antique shows and operates www.dogtreasures.com, a superb site for vintage dog-related antiques, including books, art, paper ephemera, photographs and advertising. Information: 112 W 25th St., New York, NY 10011. Admission: free; Hours: 7 a.m.-5 p.m. Saturday and Sunday, approximately 100 vendors on two covered levels. Phone: 212-647-0707.